Semtech Corporation (Nasdaq: SMTC), a leading supplier of high performance analog and mixed-signal semiconductors and advanced algorithms, announced demonstrations of its next-generation Internet of Things (IoT) applications for multiple verticals including smart cities and smart buildings. The displays will leverage Semtech’s LoRa® devices and wireless radio frequency technology (LoRa Technology), LinkCharge® wireless charging and Neo-Iso™ solid state relays. Semtech’s platforms will be exhibited in a number of consumer products demonstrated at the show, including smart Internet of Things (IoT) applications, wireless chargers and wireless charging-enabled devices, mobile devices, wearables, and tablets. The demos will range from sensors detecting moisture leaks to automatically tracking temperature to controlling power switching for connected homes and smart buildings. Semtech will be exhibiting at booth #2115, Westgate. 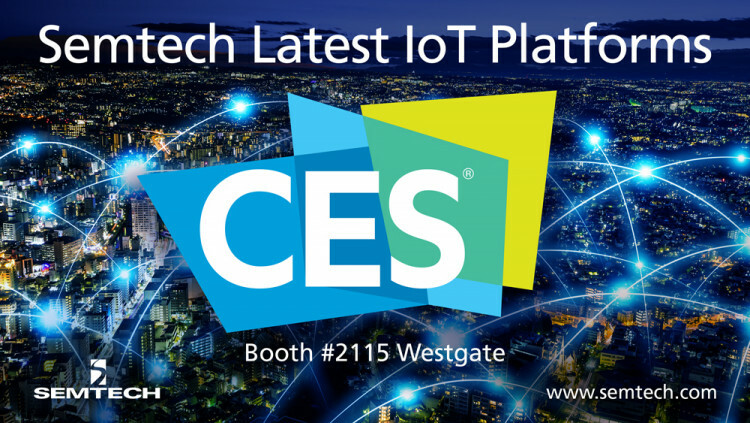 To schedule a meeting to view advanced technology solutions including the LoRa-enabled tag at CES, please contact meetings@semtech.com. Semtech’s LoRa devices and wireless RF technology is a widely adopted long-range, low-power solution for IoT that gives telecom companies, IoT application makers and system integrators the feature set necessary to deploy low-cost, interoperable IoT networks, gateways, sensors, module products, and IoT services worldwide. IoT networks based on the LoRaWAN™ specification have been deployed in 45 countries and Semtech is a founding member of the LoRa Alliance™, the fastest growing IoT Alliance for Low Power Wide Area Network applications. To learn more about how LoRa enables IoT, visit Semtech’s LoRa site and join the LoRa Community to access free training as well as an online industry catalog showcasing the products you need for building your ideal IoT application. Semtech’s LinkCharge® wireless charging platform provides a range of solutions to enable wireless power in next-generation products for consumers, infrastructure and industrial applications. It includes the LinkCharge 40 Series, the LinkCharge 20 Series, and the LinkCharge LP. The LinkCharge platform is compatible with the major industry standards ensuring end products can quickly charge any wireless charging-equipped device even as the industry adoption continues to grow and evolve. More information about LinkCharge platform and the rest of Semtech’s wireless charging solutions is available at www.semtech.com/wireless-charging. Semtech’s Neo-Iso platform is a galvanic isolated intelligent power switch family that is optimized for residential and commercial applications including compact, low-voltage IoT (i.e. smart thermostats and smart home automation systems) and HVAC applications. Its superior system flexibility, monitoring and diagnostic capabilities make it an ideal solution for reliable smart home and commercial systems that come in various shapes and sizes. Semtech, the Semtech logo, LinkCharge, and LoRa are registered trademarks or service marks, and LoRaWAN and Neo-Iso are trademarks or service marks, of Semtech Corporation or its affiliates.